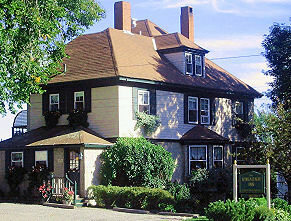 The Kingsleigh Inn, a Maine Bed and Breakfast Inn. The Kingsleigh Inn offers gracious hospitality in an elegant, sophisticated, yet casual atmosphere. Situated just 100 yards back from the water and amongst the small shops and restaurants on Main Street, our location is ideal for taking that leisurely stroll to dinner. We are surrounded by Acadia National Park;one of the most fabulous spots to view mountains and ocean in one glance. Guests enjoy gourmet, three course full breakfasts, all day espresso and tea, afternoon baked goods. 7 rooms, 1 suite (with fireplace, separate living room, king bed and turret room overlooking the harbor), some with A/C, all with private baths. Some have private decks, harbor views. All rooms have comfortable seating, queen or king beds, microfiber bathrobes, slippers, aromatherapy neckwraps and port wine and homemade chocolate truffles replenished daily. Enjoy breakfast on the wraparound porch on pleasant mornings. Let yourself be pampered here at The Kingsleigh Inn.